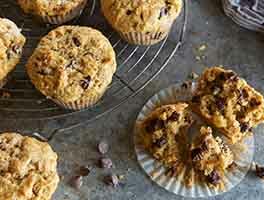 These muffins are rich and tender, high-rising, and deep chocolate, both in color and flavor. Warm from the oven, spread with butter or raspberry jam, they're a totally decadent way to greet the day. We recommend them anytime you feel like treating yourself to something really special. And, by the way, they don't need to be relegated to the breakfast table; frosted with fudgy icing, they double as an awesome cupcake. A final aside — one of the King Arthur taste-tester comments we received was as follows: "This is the best chocolate thing I've ever had to eat in my whole life, and the best thing I've ever eaten here at King Arthur." Fair praise, indeed! 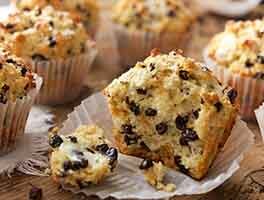 Add the wet ingredients, along with the melted butter, to the dry ingredients, stirring to blend; there's no need to beat these muffins, just make sure everything is well-combined. 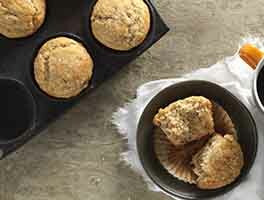 Scoop the batter into the prepared muffin pan; the cups will be heaped with batter, and the muffin will bake into a "mushroom" shape. Sprinkle with pearl sugar, if desired. 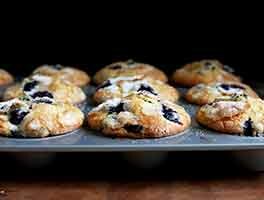 Remove the muffins from the oven, and after 5 minutes remove them from the pan, allowing them to cool for about 15 minutes on a rack before peeling off the muffin papers or silicone cups. These are so easy and so good! It isn't often that I actually follow a recipe but this one is so good I don't have to make any changes. The only problem, if you can call it such, is that I always end up with more muffins than I should. There so good and easy to make even my 12 year old can do it. If you don't have chocolate chips, a banana works too. Made these using half whole wheat flour and cutting sugar by one-third. Added 1/2 cup of walnuts. They did not rise like the muffins pictured but were nicely rounded. Wonderful deep chocolate flavor. Will make them again. Another great from KAF! I had some evaporated milk I wanted to use up so I used it instead of milk and they still baked like a charm. Absolutely decadent and delicious. Fabulous! If you did not have perfect results you have done something wrong...assess your own baking skills. This recipe is perfect and the results are perfect in every way. Follow the directions explicitly and you will be rewarded with chocolate decadence extraordinaire! KAF does it again! Any more, I only trust KAF baking recipes because of the amount of time, care, and pride that goes into their work. No exception here. I always weigh out the ingredients to the gram. I stirred then folded the batter with a silicone scraper and then let it sit for a few minutes before scooping. I ended up baking them for 22 minutes after testing at 18, just knowing my oven. The chocolate chips can be deceptive when you put the tester in so make sure you're just not testing them and end up baking the muffins too long! I like to use foil liners that are then lined with paper on the inside -- they peel off cleaner in my experience. Dense, rich, chocolatey treat! Thank you! These muffins were just amazing. I originally wanted to make the oven-baked chocolate donuts but didn't have a donut pan so I tried this recipe instead with the chocolate glaze on top. Holy cow, were they delicious! We devoured them so fast! Used a kitchen scale and they turned out very moist as well. Will definitely make these again. 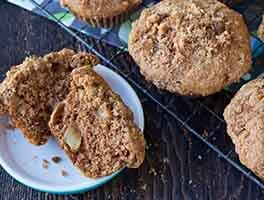 Similar to other recent posts, I too found the muffins to be a bit dry. I have a kitchen scale which I use regularly and used on this recipe with the exact amount of flour called for, and it still came out just a touch dry. I also decreased the baking time by 4 min just in case, but still just slightly dry. They weren't dry enough to warrant complaint, but they were more dry than other KAF muffin recipes I've baked. 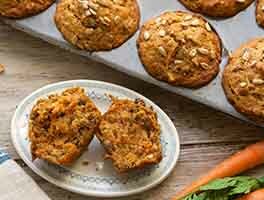 I think that's the slight disappointment-- I've come to expect moist, tender muffins with a KAF recipe and these were just a touch dry.